The first cohort of biomanufacturing students at MiraCosta College is half way through their two-year bachelor’s degree program. That’s right – Oceanside-based MiraCosta Community College is one of only 15 community colleges in California to offer a bachelor’s degree program (114 total community colleges in CA). MiraCosta’s existing biotech associates degree program, which is the oldest in the county, helped the school gain prowess as a leading community college focused on life sciences. Building on that success, this new bachelor’s program will prepare students for work within San Diego’s lucrative biotechnology industry. The pioneer behind the program is Mike Fino: a UC San Diego Jacobs School alum, former industry researcher in regenerative medicine, and current Dean of Math & Sciences at MiraCosta. With a background in industry, Mike Fino made the ideal moderator for EDC’s Link to San Diego: Life Sciences event at MiraCosta College in May. Formatted as a panel discussion followed by a networking session, Link to San Diego: Life Sciences welcomed representatives from Human Longevity Inc., Genentech, and BD to campus to speak about industry trends and lend advice to students on how they can prepare for a career in the San Diego industry. While open to all students, the program was primarily designed for MiraCosta’s biomanufacturing students to begin making industry connections and thinking about next steps as they work through their program. The group of students who attended came prepared with resumes and thoughtful questions for the speakers. MiraCosta’s biomanufacturing BA program is a prime example of how San Diego’s community college system prepares its students based on the needs of our local economy, providing opportunities and value for residents and employers alike. Now, it’s our job to keep this bright and eager talent pool in San Diego. Strengthening ties between San Diego and the U.K., Congressman Scott Peters (CA-52) and World Trade Center San Diego led a delegation to London and Cambridge, United Kingdom from October 16 – 19. Check out #SDinUK for the inside scoop. Rep. Peters and World Trade Center San Diego were joined by more than two dozen San Diego delegates from Cubic Transportation Systems, Qualcomm, San Diego Gas & Electric, Edico Genome, Takeda California, NuVasive, Forge Therapeutics, BioMed Realty, Alexandria Real Estate, Biocom, UC San Diego, San Diego State University and others. Over the course of the three-day trade mission, two significant announcements, representing both the smart cities and life sciences space, were made. San Diego became the first west coast city to enter London’s Business Welcome Programme. As part of the agreement inked between World Trade Center San Diego and London & Partners, London Mayor Sadiq Khan’s official economic development and tourism agency, London-based companies will have access to up to three months of free space at WeWork San Diego, as well as a suite of other services designed to accelerate their ability to grow in San Diego. Continually, San Diego-based Forge Therapeutics announced the launch of BLACKSMITH, a new platform being developed in partnership with Evotec AG’s U.K. team. With more than 23,000 people dying in the U.S. annually due to resistance to anti-biotic superbugs, Forge’s new platform will aid in bringing lifesaving drugs to the market. The partnership will also enable Forge to create additional jobs in San Diego. San Diego-based Cubic Transportation Systems (CTS) and its partnership with Transport for London (TfL). During this event, leaders heard from CTS’ president Matt Cole and TfL’s CTO Shashi Verma on how the collaboration moves millions of people across London daily. An MOU signing between Biocom and OneNucleus, both trade organizations that represent the life sciences sector in their respective locations, to strengthen partnerships. A conversation about leveraging electric vehicle technology as a key platform for smart cities in the U.K. with Qualcomm and SDG&E. During the panel, it was announced that Chargemaster, a licensee of Qualcomm’s wireless electric vehicle charging technology, has just opened the world’s first EV Experience Centre in Milton Keynes in the U.K. and is looking to expand elsewhere around the world. A partnership agreement in Cambridge for a ground-up development project by San Diego-based BioMed Realty, comprising 100,000 square feet of laboratory and office space for growing life sciences companies. The partnership launch was attended by newly-elected Cambridgeshire and Peterborough Mayor James Palmer. A tour and best practices exchange with Knowledge Quarter, a one mile area of London comprised of eight higher education institutions, 22 museums and galleries, 34 libraries and archives, 580 research centers, 3,000 scientists, 13,700 academics, 57,000 staff and 98,500 students. Knowledge Quarter is home to companies including The British Library, Google, The Guardian, University of London and others. San Diego-based Edico Genome and a partnership with U.K.-based Congenica. Simultaneously, Edico Genome, in partnership with Amazon Web Services and Children’s Hospital of Philadelphia, set a GUINNESS WORLD RECORD title for “Fastest time to analyze 1,000 human genomes.” The award was presented at the American Society of Human Genetics 2017 Annual Meeting in Orlando. The U.K. is one of San Diego’s most vital trading partners. U.K.-based companies directly support more than 10,000 local jobs and have poured more than $3.9 billion in greenfield investment (2003-2015) into San Diego’s economy. The U.K. is also one of the top 10 largest export markets for San Diego-produced goods and services. The trade mission was organized by WTC San Diego, with assistance and support provided by the U.K. Department of International Trade. With more than 80 research institutes throughout the region, San Diego is a breeding ground for innovative companies and institutes that solve some of the world’s toughest challenges. Perhaps no local institution has captured the region’s innovative spirit more than The Scripps Research Institute (TSRI). They are on the forefront of controlling a global epidemic. Currently, TSRI Professor Erica Ollmann Saphire is advancing new Ebola therapies and has already contributed to the development of ZMapp, the Ebola therapy from San Diego-based Mapp Pharmaceuticals, given to the first two U.S. missionaries who survived infection. 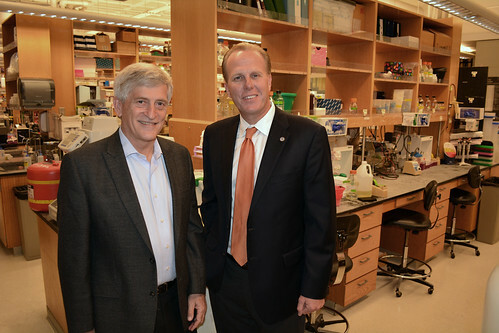 Dr. Saphire has launched a crowdfunding campaign to find new therapies for the viral disease. TSRI Professor Dennis Burton and his colleagues are also taking a global leadership role in the development of a vaccine to combat HIV/AIDS, focusing on understanding rare antibodies that are effective in neutralizing the virus. As part of his commitment to raising global awareness of the region’s innovation economy, City of San Diego Mayor Kevin Faulconer has partnered with EDC to tour some of San Diego’s most cutting-edge businesses and institutes, including TSRI last Friday. The Mayor also visited General Dynamics NASSCO and SPAWAR earlier this year. As of Tuesday, Dr. Saphire’s crowdfunding campaign has exceeded its $100,000 goal, meaning more innovation will take place right here, in San Diego. Timing is everything. With BIO 2014 in full swing, Jones Lang LaSalle (JLL) has released its list of the top U.S. life sciences clusters. No stranger to life sciences stardom, San Diego comes in third on the list. From algae biofuels to genomics, medical devices, and even beer, San Diego has seen a strong surge of cross-convergence throughout the biotech sector. “San Diego’s innovation economy is anchored by our strong biotech cluster. Not only are we home to what MIT researchers have dubbed ‘The World’s Smartest Company’ – Illumina – but the region’s leadership in stem cell research and the mapping of the human genome is second to none,” said Mark Cafferty, president and CEO of San Diego Regional EDC. A combination of top-tier universities, a strong talent pool, and innovative companies have made San Diego a bio hub. Additionally, BIOCOM has worked to accelerate San Diego’s dynamic life sciences community. This year’s rankings were based on life sciences employment concentration, employment growth, establishment concentration, venture capital funding and patents as well as NIH funding. If you are up on your rankings, you may realize that San Diego has dropped a spot since JLL 2013 rankings. In terms of job creation, San Diego is number one for life sciences employment concentration and number two for life sciences employment growth. One area where San Diego’s ranking has dropped is venture capital: “Although we saw a dip in venture capital, this can be partially explained by the rise in local biotech companies going public. Last year was one of the strongest years for biotech IPOs in the past decade, which means in many cases companies did not need to raise late-stage money,” said Cafferty. Eight San Diego companies went public in 2013 including Fate Therapeutics and Tandem Diabetes.